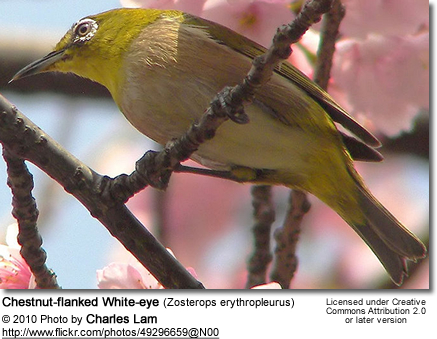 The bird genus "Zosterops" contains the typical white-eyes - traditionally placed in the white-eye family "Zosteropidae." Typical white-eyes measure between 3 - 6 inches (8 - 15 cm) - from top of the head to tip of tail.. Most of them have distinctive white feather rings around the eyes. They have rounded wings and strong legs, and slender, pointed bills and brush-tipped tongues. These sociable birds usually form large flocks outside the breeding season. 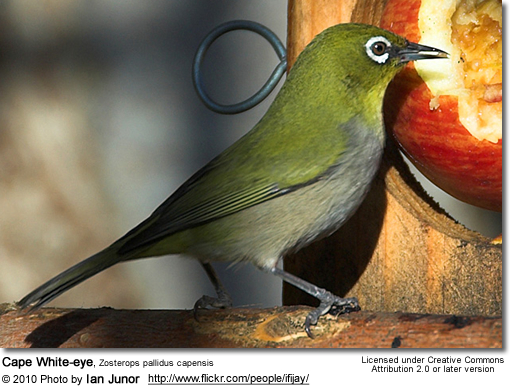 These White-eyes feed,on insects, nectar and various fruits. Their nests are situated on trees. The average clutch consists of 2 - 4 unspotted, pale-blue eggs.